Read reviews and sample chapters at Amazon. The ebook is also available. Click here to purchase from Tai Chi Productions. Born in Vietnam, Bon Trong—meaning “born strong”—was only ten months old when he was left with his grandmother in China. Little did anyone know that soon thereafter, the Communist Party under Mao Zedong would overtake China. For sixteen years, Bon Trong suffered abuse and terror from the Communist rule and narrowly escaped death from starvation during Mao’s disastrous Great Famine, when seventy millions did not. When Bon Trong was sixteen he escaped to Hong Kong, where he was distressed by the shock of the new culture and his heart-wrenching separation from his aunt. However, he was determined to win approval from his parents, from his family, but most of all, from himself. Later in Australia he finally experienced freedom for the first time in his life. Paul, as he was now known, chose the path of healing early on when he decided to become a doctor. He came to realize how much he loved medicine, and it became clear his calling was to heal people. The years of starvation and malnutrition had left their mark with disabling arthritis since his teen. He began studying tai chi with his father-in-law hoping to ease his painful arthritis. Moved by the art he became an avid learner and expert in tai chi. Feeling he could help others, he started teaching others. From classes locally to workshops to lectures globally to creating DVDs to writing books. Dr Paul Lam has dedicated his life to spreading the health benefits of tai chi around the world. He has changed the lives of millions of people who seek to connect their mind, body, and spirit through tai chi, fulfilling his destiny to become a true healer. “…Dr. Lam, perhaps more than anyone else on the planet, has been a force in expanding Tai Chi and Qigong into modern healthcare at all levels–has enabled modern healthcare to un-grip from its past of discounting Eastern wisdom, and reform itself into something new and larger, where Eastern and Western wisdom can join hands for the betterment of society. In some ways, all Tai Chi teacher’s working in hospitals are riding on the shoulders of Paul’s early work…In his book, Dr. Lam talks about how he resisted naming his school after himself, because he didn’t want it to be a cult of personality, but a way to expand Tai Chi knowledge into the world, enabling it to be owned by many. Our work organizing World Tai Chi Day events worldwide, which has included the participation of Paul and many teachers Paul Lam trained, seeks to follow Dr. Lam’s vision, empowering the entire world to see Tai Chi as “their thing” and even further expanding these amazing treasures from Chinese culture throughout the world. 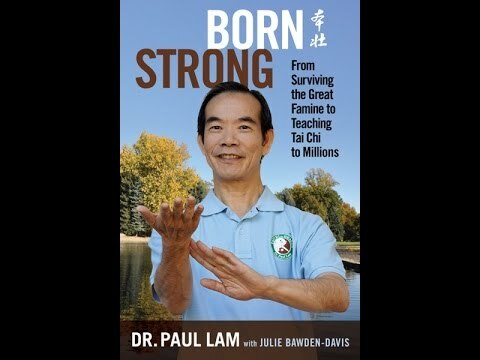 “Born Strong will first appeal to Dr. Lam’s million plus tai chi students whom he or his world-network of instructors have taught. But over time, the book will attract a much broader audience. Anyone who has faced adversity will find comfort through reading it. Dr. Lam weaves a story regarding the power of the indomitable human spirit striving and succeeding in overcoming what appear as insurmountable obstacles. Poverty, starvation, murderous regimes, debilitating health issues, severe bullying, and vast cultural differences are just a few in a litany of challenges faced and met. An added bonus is that he provides readers with suggested ideas and skill sets that will allow them to cope with their personal challenges. ike you are sent to teach those of us who are privileged to raise you, many lessons not least of all the “gifts of the darkness” and also that the flame of hope is always there deep within us if we have the courage to believe. I am so grateful that ACC chose Tai Chi for Health to be their falls prevention modality as without that happening there is no way I would be part of the tai chi family and have the gift of teaching tai chi in my life and to you I am grateful for your courage and determination to bring Tai Chi for Health to the World. Congratulations on the wonderful book. I hope it sells hugely worldwide so that people can be touched and inspired in the way that I have been. You can read more reviews on Amazon, and place your own review there. “Certainly Chairman Mao couldn’t hear the rumbling in my stomach, and he must not have known that someone stole our rice. Otherwise he would have come to our rescue. I had, after all, squeezed my eyes tight and prayed – his kind face in my mind’s eye, asking him for an overflowing bowl of rice and not the mere handful of tiny grains Aunt always made into congee. But even the thin, tasteless porridge seemed like a royal feast now that our ration had been stolen a full five days before we would receive more rice. Once verdant and lush, the land around us stood consumed. The sky no longer home to birds, the rice paddies and river no longer a haven for the small fish I once walked past, and the land no longer bursting forth with vegetation. I always enjoy finding all the factors of a problem and creating a formula to solve it. I applied it to understanding how the body and mind function, and working out ways to make them work better. I cherished finding the right therapy to solve each individual’s health challenge, and in tai chi I love to find the most effective way to develop and enjoy the art. Ultimately, I love to find a solution to empower people for better health and wellness. I talk to my patients, friends and tai chi colleagues and participants of my workshops about this topic frequently. Here is a recipe for health that I have found it works for me and many of the people I have interacted with. Most of these are woven into this book. I try to focus on the positive or bright side, though it is human nature to focus on the negative. That can be helpful in extreme circumstances – it makes us work harder in case of disaster. In normal times, however, negativity can adversely affect our health, thinking and relationships. By looking for the best qualities in people I enhance my relationship with them. Everyone likes to be recognised, which help them to be more confident and more effective and their attitude becomes more positive towards me – a win-win situation. Whenever I feel down I remind myself to “song” my joints – a tai chi state of gently loosening the joints, thus strengthen the body and induce relaxation, and to stand tall. I may not be feeling great, but that simple change in posture tricks my mind into feeling less stressed, and thinking more upright. Even at really bad times, being sad does not make matters any better. I find the psychologists were helpful when they said: “if you cannot be happy, pretend to be, and soon you would!” Even if I cannot be happy, I would be better off than focusing at sadness. I realised in my twenties that I needed to take responsibility for my own health. With crippling arthritis I could have relied entirely on drugs to keep me relatively pain free. It took dedication to establish a major improvement through tai chi, but on the way I learned that keeping physical and mental balance in my life was the best way to cope with the condition, as well as most matters in my life. As I develop, I take more responsibility for my actions. Whenever something goes wrong, I make a great effort not to blame the circumstances and other people, not even the weather! Blaming anything including myself does not help me to get to a better place, it is a waste of time; it might sooth my insecurity for a little while but does not help it at all. I find it more helpful to focus on analysing the situation rationally, what was done well and what can be improved. Very importantly to develop inner strength which would reduce insecurity. For more Free Tai Chi lessons please visit Dr Lam’s instructional DVD and books. Which DVD/program is most useful for me?